While 2018 has seen a continuation of the worrying trend of golf clubs closing down on both sides of the Atlantic, the flip side is that new courses are still coming on stream in both North America and Europe. Not to be left out, both Africa and the Gulf States have also seen significant debuts. However, it’s Vietnam that’s seeing the fastest growth in golf course construction. Its burgeoning golf scene is powering on with a spate of new openings, including in the central coast area, around Danang, known as Golf Coast Vietnam. At the BRG-owned Da Nang Golf Resort’s Danang Golf Club (green fees from £70), the existing 18-hole Greg Norman course has seen the addition of a nine-hole course by Nicklaus Design. The course features wooden bulkheads similar to those used on courses in Florida, imported from the US, and is said to be the first course in Asia to incorporate them. It’s also floodlit for evening play. Also in the same area, a new Robert Trent Jones Jr course is under construction at Hoiana Shores Golf Club, about five miles south of the UNESCO-listed ancient fishing town Hoi An, with a projected opening of mid-2019. Close to Hanoi, the 19-hole Jack Nicklaus II signature Kings Course has opened at the BRG Kings Island Resort (green fees from £87) to take the resort to a total of 55 holes on three courses. The new course includes an extra par-3 that plays from above a rock waterfall to an island green. 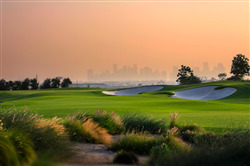 In the Gulf, October sees the soft opening of the Education City Golf Club, Qatar (green fees from £183), with an 18-hole design by Jose Maria Olazabal laid out through landscaped desert that opens fully in January 2019. An ancient wadi wall is a feature of the terrain, the riverbed coming into play on several holes on both nines. In addition to its championship course, the club has a six-hole layout that offers a similar challenge but can be played in 90 minutes, as well as a nine-hole, par-3 course, both also by Olazabal and both floodlit. Neighbouring Saudi Arabia will join the European Tour’s Desert Swing when a new tournament kicks off in January 2019 at the Royal Greens Golf & Country Club (green fees from £51), just over 90 miles north of Jeddah on the Red Sea coast. Opened in May within the King Abdullah Economic City, the course was designed by European Golf Design and incorporates numerous wadi features, freeform desert waste areas and the Red Sea shoreline forming the backdrop to holes 15, 16 and 17. The course is managed by Troon Golf and includes an academy. The first Jack Nicklaus signature golf course in Morocco had its official opening in September. The 18-hole Michlifen Golf & Country Club layout forms part of the five-star Michlifen Resort & Golf and is laid out at an altitude of almost 5,500ft in a mountain landscape of evergreen and cedar forests in Ifrane. It’s right in the heart of the Middle Atlas range — known as ‘Little Switzerland’ for its alpine features — and located an hour from Fez. The course has USGA-specification greens, tees, bunkers and fairways, and is playable from early spring to late autumn thanks to its altitude. Michlifen is managed by IMG as part of its IMG Prestige portfolio and also includes an academy. Still in Africa, the October 2018 debut of a second nine holes at Lake Victoria Serena Golf Resort & Spa, south of Kampala in Uganda, comes nine years after the opening of its original nine. The course offers golfers views over Lake Victoria and a plethora of wildlife, while the finishing hole on the original nine boasts an island green. At the crossroads of Europe and Asia, Georgia gained its first 18-hole golf course with the summer 2018 opening of Tbilisi Hills Golf Resort (green fees from £60). Located at the foot of the Caucasus Mountains and overlooking the country’s capital city, Tbilisi, it’s a European Tour Properties facility that was designed by Lassi Pekka Tilander. A hotel is planned as part of the development. Regnum Golf and Country Club Bodrum features the first 18-hole golf course in Turkey’s Aegean coast resort of Bodrum. The Tim Lobb-designed course is laid out on a hilly former olive grove and olive oil from the site is being marketed as a house product by Regnum. The project will also include 157 villas. Trained goat caddies wearing specially designed harnesses carry the golf clubs — and a six-pack of beer — for golfers playing the seven-hole McVeigh’s Gauntlet golf course that opened in July at The Retreat & Links at Silvies Valley Ranch in eastern Oregon as the hilly course is too steep for golf buggies. A working ranch and resort, Silvies also opened two reversible 18-hole golf courses, the Craddock and the Hankins, in 2017 with 2018 being their first full season. Each course has nine greens of its own, with nine shared to give 27 greens in total. Golfers play one or the other on alternate days. At Big Cedar Lodge in Missouri, design duo Bill Coore and Ben Crenshaw combined to create the 18-hole Ozarks National (green fees from £95) course. A walkable course open from November 2018, it reflects the surrounding Ozark-St. Francis National Forest scenery and includes a wooden bridge for golfers and buggies between the 13th tee and green that spans 400ft and is 60ft above a flowing creek at its highest point. Another 18-hole course at Big Cedar Lodge, Payne’s Valley, is due to open in autumn 2019 and will be the world’s first course designed by Tiger Woods’ design firm, TGR Design, with full public access. It’s been named in honour of Payne Stewart, the three-time Major winner who died in a plane crash in 1999. Finally, Big Cedar’s original 18-hole course, Buffalo Ridge Springs, has undergone a redesign by architect Tom Fazio together with conservationist Johnny Morris to bring players into close contact with nature, from native grasses to free-ranging bison from the nearby Dogwood Canyon Nature Park.